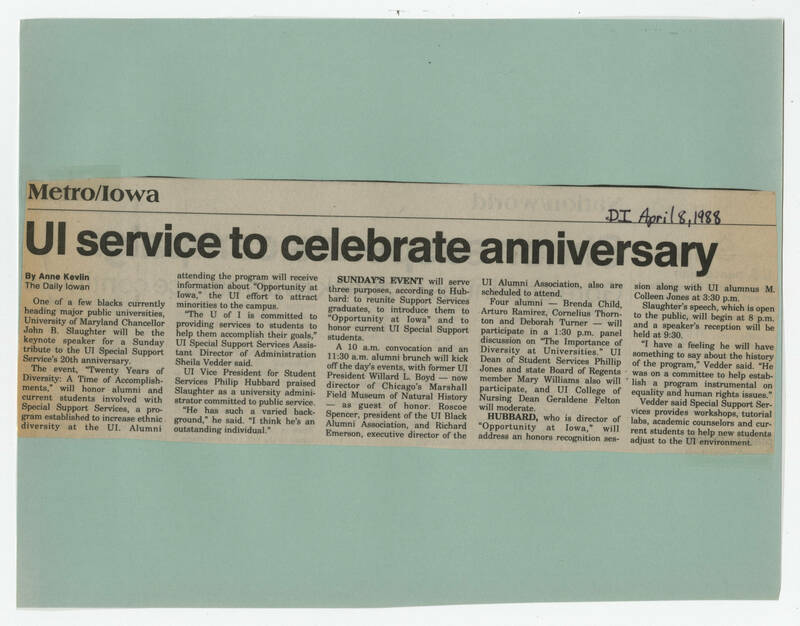 Metro/Iowa [[Handwriting]] DI April 8, 1988 [[Header]] UI service to celebrate anniversary. [[Bold]] By Anne Kelvin [[End bold]] The Daily Iowan [[Article text]] One of a few blacks currently heading major public universities, University of Maryland Chancellor John B. Slaughter will be the keynote speaker for a Sunday tribute to the UI Special Support Service's 20th anniversary. The event, "Twenty Years of Diversity: A Time of Accomplishments," will honor alumni and current students involved with Special Support Services, a program established to increase ethnic diversity at the UI. Alumni attending the program will receive information about "Opportunity at Iowa," the UI effort to attract minorities to the campus. "The U of I is committed to providing services to students to help them accomplish their goals," UI Special Support Services Assistant Director of Administration Sheila Vedder said. UI Vice President for Student Services Philip Hubbard praised Slaughter as a university administrator committed to public service. "He has such a varied background," he said. "I think he's an outstanding individual." [[bold]]SUNDAY'S EVENT[[end bold]] will serve three purposes, according to Hubbard: to reunite Support Services graduates, to introduce them to "Opportunity at Iowa" and to honor current UI Special Support students. A 10 a.m. convocation and an 11:30 a.m. alumni brunch will kick off the day's events, with former UI President Willard L. Boyd -- now directer of Chicago's Marshall Field Museum of Natural History -- as guest of honor. Roscoe Spencer, president of the UI Black Alumni Association, and Richard Emerson, executive director of the UI Alumni Association, also are scheduled to attend. Four alumni -- Brenda Child, Arturo Ramirez, Cornelius Thornton and Deborah Turner -- will participate in a 1:30 p.m. panel discussion on "The Importance of Diversity at Universities." UI Dean of Student Services Philip Jones and state Board of Regents member Mary Williams also will participate, and UI College of Nursing Dean Geraldene Felton will moderate. [[Bold]]HUBBARD,[[end bold]] who is director of "Opportunity at Iowa," will address an honors recognition session along with UI alumnus M. Colleen Jones at 3:30 p.m. Slaughter's speech, which is open to the public, will begin at 8 p.m. and a speaker's reception will be held at 9:30. "I have a feeling he will have something to say about the history of the program," Vedder said. "He was on a committee to help establish a program instrumental on equality and human rights issues." Vedder said Special Support Services provides workshops, tutorial labs, academic counselors and current students to help new students adjust to the UI environment.